ECM has partnered with the youth ministry of the Episcopal Diocese of MA to put on Las Fronteras, a high school youth program. This program explores issues of security and hospitality, strangers and neighbors, and privilege and disadvantage, through service learning opportunities in Massachusetts, facilitated conversations, and a trip to the borderlands between Sonora, Mexico and Nogales, Arizona. The program has involved a cohort of seven youth, meeting for a series of overnight retreats and site visits in preparation for their pilgrimage to the borderlands in August of 2019. The retreats involve learning community organizing skills, exploring spiritual practices, building relationships across the cohort, and learning fundraising methods. In March, the Las Fronteras cohort gathered in Brockton, MA for their fourth overnight retreat. The first night of the retreat involved rich community building and spiritual exploration. After playing a few trust-building games, the participants engaged in a spectrum discussion activity. This involved a spectrum on the ground from Yes to No. Participants were asked a series of questions about their faith, spirituality, comfort with being identified as a Christian, and more. This activity produced honest and vulnerable discourse about what it means to have faith and what spirituality can look like. We then embarked on a collaging activity around our spiritual autobiographies. We ended the night with an interactive bible study on John 2:13-17, using an activity inspired by the “Theatre of the Oppressed.” In the activity, the youth turn themselves into a statue representing the bible story. We had some interesting impressions of Jesus making a scene in the temple! Facilitating this group of white, suburban youth as a person of color has been an interesting experience. I feel responsible for making sure each participant takes time to analyze their privilege and what their real reasons for going on this trip are. Is it rooted in a call to justice work? Do they want to learn about who lives in the borderlands between Mexico and the US, who wants to immigrate to the US, and how hard the process to get here is? Do they want to engage with justice work happening here in Massachusetts? Do they want to listen, witness, and learn? Do they just want an experience to add to their resume? Teasing these questions out and guiding people to find their honest reasons for pursuing this trip has raised some tensions. I’ve heard comments that are just a skip and a hop from a white savior complex, and the responsibility I feel to stop that train in its tracks and reroute is overwhelming at times. These are the hopes I hold for the youth preparing to journey to Las Fronteras. I hope the trainings we’ve done on storytelling and resonating have prepared them to listen with open ears and an open heart. I hope the exercises we’ve done on unpacking their privilege has prepared them to check their privilege and humble themselves. I hope the exposure we’ve given them of community organizing work happening in Massachusetts has planted seeds that grow into continued engagement with local justice work after their trip. I hope the spiritual practices and discussions we’ve led them through allow them to feel grounded as they prepare to travel, explore, and learn. I read an article about James Reeb this week, and after hearing a sermon on Dorothea Dix, I am thinking about how UUs have history of bearing social witness. Somewhere I read how one of the reasons the Holocaust happened is because it happened far away from people's view so there weren't enough witnesses who felt connected to the people and so they never stopped it. At the immigration meeting at my church after the service, I thought one of the most interesting parts was hearing people's stories and the profound impact that witnessing the unfairness of the system had on people who had given rides to immigration court or to an ICE check-in. We briefly talked about how we could get more people to give rides, even as observers, because once people see the chaos that immigrants are forced to live in as they try to become documented, they can more effectively advocate, or at the very least, comfort people who are going through a struggle that has a process that intentionally removes power and keeps people dependent and in fear. For example, we talked about how Elizabeth had given a ride, and the woman came out with this infant child seat for her 5-year-old. Luckily, Elizabeth had a booster for a 5-year-old, but the family looked like they had already had a long and stern conversation with the child about how they knew how important a carseat was and that obeying every detail of the law was going to be important, and had prepared the child for a car ride in this ill-fitting seat and to do it without complaint. There was already a high level of anxiety, of course, for getting in a car with someone who doesn't speak your language, and who you have never met before to go to a check-in whose purpose is sometimes unclear. Elizabeth also told us about how the day took 12 hours because the appointment was at 9am. You have to get to Burlington at 9am, but the receptionist can call your number in line at any time, so they waited there for nearly 5 hours before the woman could get in to see the person she had an appointment with. The driver said the room was full of the most well-behaved children she's ever seen, especially for sitting quietly for hours and hours. Food wasn't allowed in the office and people at the appointments couldn't leave the room, or they would lose their place in line. Because Elizabeth was there, she went to the car and got snacks and water for some of the people in the room with children, and also brought in some coloring activities for the children who were getting restless at hour 6 and 7. She also is pretty sure that because she is White, the staff didn't say anything like they might if one of the people with an appointment had brought in food and shared it. She has several other stories about how the system was set up to be chaotic, and the stress she could see in the people at the office and the anxiety of the people who she had driven. In the group, we discussed what other things can we offer the families beyond a ride, like comfort at a time of anxiety and even danger. Having a witness to an injustice may not be the kind of comfort people immediately think of, but I know that it helps if I have someone who also sees me being mistreated and can have my back. Kelly is working on a guide for drivers, and is going to include some common friendly phrases like "What kind of music do you like?" with some options of radio stations or types of music, and some phrases in Spanish (and hopefully in K’iche’) like "Do you need to use the bathroom? ", "Are you hungry? ", "Would you like a hug?" - for after the meeting when people can be so stressed out they cry. If there are other words that are helpful for comfort and support, we are also trying to include some of those phrases. We also discussed how people who don't have access to cars or have money to donate for gasoline can contribute (like making call to Rep. Strauss), and we discussed some snack creation or support in creating some quiet busy bags for kids who are spending so much time at these meetings and waiting in offices. The ability to be a witness should be more inclusive. I expect the next meeting will also be effective because there are stories from people who are experiencing this chaos and who have the language skills to share their stories, and from the witnesses who can support the experience and understand it in detailed ways that get to deeper issues of the United States’ dysfunctional immigration system. IMAGE DESCRIPTION: About one hundred people eat dinner around long banquet tables. Caption: a photo from a recent gathering of drivers and riders from the bristol county transportation network. 1. Proíbe perguntar sobre status imigratório: Barra a polícia e funcionários da Corte de perguntarem por status imigratório a não ser que haja uma exigência legal. A polícia estadual já tem uma norma parecida. Muitos imigrantes temem chamar 911 ou falar com a polícia com medo de serem separados de suas famílias – especialmente das crianças. Isso torna as pessoas mais vulneráveis a crimes de violência doméstica e roubo de salário, por exemplo. Não perguntar sobre status imigratório enviaria uma mensagem clara de que na nossa comunidade a polícia protege todas as pessoas. 2. Protege o processo legal: Antes que oficiais de imigração (ICE) interroguem alguém sob custódia, eles têm de obter o consentimento da pessoa em um formulário que explica que estas pessoas têm direito de se recusar a falar com os oficiais e de ter seu próprio advogado presente. Sem esta proteção, as pessoas muitas vezes dão informação ou assinam documentos que prejudicam seus processos na imigração. Quem não tem cidadania, muitas vezes ignora seus direitos, porque a notificação chamada “Miranda” não é exigida no contexto da imigração civil. 3. Limita notificações da polícia para agentes do ICE: Barra a polícia, funcionários da Corte e das cadeias de notificar os agentes do ICE que alguém vai ser liberada. Às vezes, policiais contatam agentes do ICE para tentar manter um imigrante detido mas, se esta pessoa tivesse cidadania, seria solta. Esta medida não impede agentes do ICE de serem notificados sobre a liberação de uma pessoa sendo liberada após cumprir uma sentença criminal. 4. Acaba com os Acordos 287G: Acaba com os contratos que permitem a polícia estadual e municipal agir como se fossem agentes de imigração, as custas do contribuinte. Estes contratos são a forma mais extrema de entendimento com o ICE e, quando uma pessoa passa para a custódia do ICE, antes de ver um juiz, seu processo legal fica prejudicado. Massachusetts é o único Estado da Nova Inglaterra que tem tal acordo. Temos acordo em Bristol, Barnstable, Plymouth e com o Departamento de Correções. 5. Treina e responsabiliza: exige que agências que trabalham aplicando a lei treine seu pessoal e, se houver alguma violação, pode-se fazer reclamar com a agência principal ou com a Procuradoria Geral. O treinamento garante transparência e identifica problemas emergentes. Massachusetts precisa mandar uma mensagem clara que na nossa comunidade, as leis protegem todos e todo mundo disfruta dos direitos civils. Las Fronteras is a high school youth program that ECM is launching in partnership with the Episcopal Diocese of MA. The program explores issues of security and hospitality, stranger and neighbor, privilege and disadvantage through service learning opportunities in Massachusetts, facilitated conversations, and a trip to the Nogales borderlands. While visiting the local arts center and radio station, Zumix, they were also interviewed by a community member of Nuevo Amanecer who hosts a program about East Boston as part of her work with Stand for Democracy. Their interview and photos can be found here on the “Stand for Democracy” facebook page. In February, the Las Fronteras cohort attended the Diocesan High School Retreat at the Barbara C. Harris Campgrounds in New Hampshire. In addition to the spiritual and recreational activities offered by the retreat, the cohort met to discuss how fundraising is going so far (each youth is asked to raise $2,100 to support the cost of the trip to the borderlands), and hear from alumni who have gone on the trip in the past. In March, we’ll be gathering for next overnight retreat and site visit with Brockton Interfaith Community (BIC) and Grace Chapel in Brockton, MA who are both ECM grantee partners. These words written by Bob Holmes in the Contemplative Monk, an online resource, spark my curiosity. If he is right and we are in a figurative national Lent, a reassessing of everything that we believe, then how are faith-rooted and spiritual individuals and congregations taking responsibility to reflect on our role in this time of “social and spiritual upheaval”? And as former Archbishop Rowan Williams names, how are we developing “eyes for the absurd as well as the corrupt in language and action, public and private”? Lent is a Christian church season of forty days, not counting Sundays, which begins on Ash Wednesday, this year, Wednesday, March 6th and ends on the Saturday before Easter, Holy Saturday, April 20th. The word lent means lengthening of days or spring time. The forty days represent the time of Jesus’ temptation in the wilderness as he prepared to begin his ministry. Lent is a season of repentance. Repentance means turning towards God and away from sin. It is marked by a change in our spiritual and mental attitude and requires self awareness and honesty about what is keeping us distracted or separate from God, ourselves and one another. Lent is a time of focused prayer, self-examination, reflection and fast, in preparation for the coming of Easter, resurrection and new life. This Lent I have chosen a personal, embodied spiritual practice and fast, however, the preparation for this reflection has led me to choose a public leadership Lenten practice as well. I am thankful for my colleagues, Hall Kirkham+, Holly Antolini+, Mariama White Hammond+, Liz Steinhauser+ and Mike Stevens who led me to the writing of a contemplative theologian, a philosopher and a former Archbishop of Canterbury Rowan Williams, and the witness of Memorial for Peace and Justice. Throughout the six weeks of Lent, I will have a weekly conversation with a spiritual and/or grassroots leader to learn how they are understanding the connection between healing and justice - between repentance, forgiveness and justice. I want to strengthen my leadership by hearing how others tend to or pull at the root causes of this spiritual and social upheaval which I believe is racism. And I want to discover, how is the Spirit inspiring them to turn towards God and one another in bringing about healing and justice? I hope you will share how you and/or your community are approaching these questions of healing and justice. In this newsletter, you can learn how others are preparing the way with action, education, spiritual reflection or deepening relationships. Learn of brave conversations at St. Andrew’s, Ayer about immigration; spiritual renewal and community building through spiritual practice and storytelling with lay leaders from BIJAN (Boston Immigrant Justice Accompaniment Network); and exciting accompaniment and advocacy in Bristol County; and meet leaders of Misa Aleluya, an exciting Latinx episcopal ministry in Worcester, that is a part of ECM’s Prophetic Listening Project. A respected colleague, the Reverend Holly Antolini, shared a Facebook post from her admired colleague, the Reverend Jonathan Patrick McGinty, a priest in the diocese of Long Island. Arendt’s wisdom connects to conversations I have had with those who have taken pilgrimages to the Equal Justice Initiative National Memorial for Peace and Justice which opened to the public on April 26, 2018. The Memorial is “the nation’s first dedicated to the legacy of enslaved black people, people terrorized by lynching, African Americans humiliated by racial segregation and Jim Crow, and people of color burdened with contemporary presumptions of guilt and police violence”. I am grateful for the leadership of Bryan Stevenson and many others as they envisioned such an important memorial that places before us a history foundational to our country’s spiritual and social upheaval. Pastor Jim Wallis underscores this fact with his claim that “America's problem with race has deep roots, with the country's foundation tied to the near extermination of one race of people and the enslavement of another. Racism is truly our nation's original sin. It's time we right this unacceptable wrong." Our “nation’s spiritual and social upheaval” must be examined in the light of the deep roots of American racism. The former Archbishop of Canterbury Rowan Williams’ book review, "A Nervous Breakdown in the Body Politic”, examining what enabled the rise of evil in Hitler’s Germany, offers helpful caution and encouragement for this reflection. The conventional wisdom holds that “all that is necessary for the triumph of evil is that good men do nothing”, in Edmund Burke’s familiar phrase; but this is at best a half-truth. Studying the biography of a moral monster triumphantly unleashed on the political and international stage points us to another perspective, no less important. What is necessary for the triumph of evil is that the ground should have been thoroughly prepared by countless small or not-so-small acts of petty malice, unthinking prejudice and collusion. Burke’s axiom, though it represents a powerful challenge to apathy, risks crediting evil with too much of a life of its own: out there, there are evil agencies, hostile to “us”, and we (good men and women) must mobilise to resist. A network of wise colleagues and the insight of Bob Holmes, Hannah Arendt and former Archbishop Rowan Williams prepare the way for my Holy Lent. I enter this Lenten season of repentance, with the prayer, Holy God, turn me even more fully and honestly towards where You are already at work healing and creating whole, equitable and just communities. In these next forty days, I will learn about healing that is already taking root in communities like Brockton Interfaith led by Will Dickerson and the Mission Institute led by Diane D’Souza and Katie Caprnst and until recently Myriam Hernandez Jennings and the healing practice of spiritual reflection among BIJAN leaders accompanying immigrant neighbors and siblings. If you have a suggestion of a community or leader who inspires your understanding of racial healing and justice, please email me their name and contact information at arrington@episcopalcitymission.org. I am thankful for how my relationships with you, call me into the deeper waters of new life. Hannah Arendt is a German Jewish philosopher born in 1906. She was forced to flee Germany in the 1930s as Hitler came to power. She is best known for her major works, including “The Human Condition,” “On Violence,” “Truth and Politics,” “The Origins of Totalitarianism” and especially MsAS “Eichmann in Jerusalem: A Report on the Banality of Evil,” which grew out of her coverage of the trial of the Nazi Adolf Eichmann for The New Yorker. Wallis, J. 2016 “America's Original Sin: Racism, White Privilege, and the Bridge to a New America”, Brazos Press. 1. No más preguntas sobre el status migratorio: Prohíbe que los oficiales de la ley y de la corte hagan preguntas sobre el status migratorio, a menos que la ley lo exija. La Policía del Estado tiene una política similar. Muchos inmigrantes temen si llaman a 911 o hablan con la policía, los separarán de su familia, especialmente de sus hijos; esto los deja vulnerables a la violencia doméstica, el robo de salarios y otros abusos. Queremos dejar claro que en Massachusetts, la policía nos protege a todos. 2. Protege el debido proceso legal: Antes de que Inmigración y Control de Aduanas (ICE) pueda hablar con alguien bajo custodia local, la policía tendrá que obtener el consentimiento del individuo afectado, usando un formulario que explique su derecho a rehusarse o a tener un abogado presente. Sin estas protecciones, es común que las personas hagan declaraciones o firmen documentos que les perjudican. Como en el contexto civil, no se requieren estas advertencias, muchas veces los inmigrantes no saben que tienen esos derechos. 3. Limita las notificaciones a ICE: Impide que la policía y los funcionarios judiciales y de las cárceles notifiquen a ICE que alguien está a punto de ser liberado. A veces, los oficiales llaman a ICE para tratar de evitar que un inmigrante salga en libertad cuando ya no pueden retenerlo, aunque un ciudadano saldría libre. Aún podrían notificar a ICE si una persona está cumpliendo su sentencia penal. 4. No más acuerdos 287 (g): Cancela los contratos con ICE que permiten que oficiales de la ley actúen como agentes de inmigración, a expensas del estado. Estos contratos son una forma extrema de involucramiento con ICE, y cuando evitan que las personas acudan a los tribunales, les niegan el debido proceso legal. Massachusetts es el único estado en Nueva Inglaterra con acuerdos 287(g), con cuatro: en los condados de Bristol, Barnstable y Plymouth, y en el Departamento de Correcciones. 5. Proporciona importante capacitación y responsabilidad: Requiere que las agencias afectadas entrenen a su personal sobre esta ley, y permite que se presenten quejas ante la agencia relevante o la Fiscalía General si se alega que haya habido una violación. Estas disposiciones ayudarían a garantizar la transparencia y abordar los problemas a medida que surjan. Es hora de que Massachusetts envíe un mensaje claro de que en nuestro estado, la policía nos protege a todos, y todos disfrutan de derechos civiles. ¿Tiene preguntas? Contacte a Laura Rótolo, lrotolo@aclum.org o 617.482.3170 ext. 311. 1. No questions about immigration status: Bars law enforcement and court personnel from asking people about their status unless required by law. The State Police already have a similar policy. Many immigrants fear that calling 911 or speaking to police will lead to separation from family members – especially children –making them more vulnerable to domestic abuse, wage theft and other crimes. This provision would send a strong message that in our Commonwealth, police protect us all. 2. Protects due process: Before Immigration & Customs Enforcement (ICE) questions someone in local custody, requires police to obtain their consent using a form that explains their right to decline an interview or have their own attorney present. Without these protections, people often make statements or sign documents jeopardizing their immigration cases. Non-citizens often unaware of these rights, because “Miranda” warnings are not required in the civil immigration context. 3. Limits notifications to ICE: Bars police, court officers and jail officials from notifying ICE that someone is about to be released. Sometimes law enforcement will call ICE to try to keep an immigrant from going free when they can no longer hold them, even though a citizen would go free. The bill would still allow notifications to ICE if a person is being released after serving a criminal sentence. 4. No more 287(g) agreements: Ends contracts with ICE that allow state and county personnel to act as federal immigration agents, at state taxpayers’ expense. Such contracts are the most extreme form of entanglement with ICE, and when they shift people into ICE custody before they can go to court, they undermine due process. Massachusetts is the only state in New England to have such agreements, and we have four: with Bristol, Barnstable Plymouth counties, and the Department of Corrections. 5. Provides crucial training and accountability: Requires law enforcement agencies to train their personnel about this law, and if there is an alleged violation, people can file a complaint with the relevant agency or the Attorney General. These provisions would help ensure transparency and tackle problems as they arise. It’s time for Massachusetts to send a clear message that in our Commonwealth, law enforcement protects us all, and everyone enjoys civil rights. Over a year ago, the members of the Unitarian Universalist church in Fairhaven began to meet and discuss the policies of the current administration on immigration. They were looking for ways to do something to assist immigrants because one of the core beliefs of Unitarian Universalism is the inherent worth and dignity of every human being. At the urging of their minister, Rev. Jordinn Nelson Long, the group participated in a webinar offered by the American Friends Service Committee on accompaniment. Reverend Jordinn had been approached by BIJAN (Boston Immigration Justice Accompaniment Justice Network) about speaking to a local immigrant in custody in Bristol County. In September, Episcopal City Mission (ECM) reached out to our church and several other local churches to become more involved in immigration justice. ECM staff invited members of the churches and various community organizations working on immigration issues in the Greater New Bedford area. A few weeks later, members of the UU Fairhaven, Kelly Ochoa and Laura Gardner met with Brian Pastori of the Community Economic and Development Center (CEDC) in New Bedford and Dax Crocker of ECM. The goal of the meeting was to explore ways in which the members could develop a way to aid the CEDC in supporting the increasing number of immigrants in New Bedford. Laura and Kelly were able to set up a network of drivers who were willing to drive immigrants to appointments in Boston, Burlington and Worcester. Previously, the CEDC had a few drivers who had taken immigrants to appointments. BIJAN has an extensive network of people who accompany immigrants to court in the Boston area. The numbers in New Bedford are not as large but the need still exists. To date, 29 rides have been provided by various members of the network created by Kelly and Laura. Rides have been given to Worcester, Burlington and Boston. On Sunday, March 3rd, drivers and riders gathered at St. Martin's Episcopal Church in New Bedford for a celebration of the growing network. Community members who have received rides expressed gratitude by preparing a meal for those who have offered rides. ECM’s ten-month program, “Prophetic Listening” works with parishes to deepen the parish’s sense of relational culture, begin or join a community justice initiative in their community, and increase the number of people engaged in the work of community engagement. In the program, teams made up of parishioners and wider community members learn leadership practices that enable them to listen and respond to how God is calling them to love boldly and do justice. This month we are lifting up the work of Misa Aleluya, a Latinx congregation that worships at All Saints Worcester, through an interview with the facilitators who are leading the congregation through the PLP program. Padre Jose Reyes is the Missioner for Latino/Hispanic Ministries in the Diocese of Western MA and the Lead Pastor of Misa Aleluya. Deacon Ema Rosero is a Deacon in the Diocese of Massachusetts and has ample experience in nurturing hispanic ministries in our church. Savannah Haugh is a former life together intern who served with Padre Edwin Johnson at St. Mary’s in Dorchester where they supported a vibrant Latinx ministry. ECM interviewed Savannah, Padre Jose, and Deacon Ema this week. ECM: When did Misa Aleluya begin? And, how would you describe the congregation? JR: Misa began in September 2016 and, since then, we have grown from an average Sunday attendance of 5 to 35 parishioners. We are a congregation that tries to embody God's love in the world: love for ourselves as children of God, which inspires us to step up as leaders in our community; love for each other, seeking the face of Christ in everyone we meet even if they look, sound and think differently from us; and loving our community by being a congregation that listens and is present in our neighborhood as an influence and an example of compassion and grace. ECM: What motivated you to join the Prophetic Listening Program? JR: In the past two and a half years we have been focusing internally; on growing the church and raising up new leaders. However, the work of the Church is in the community. While we will continue to work on growing spiritually and as a congregation, we are now at a point where there is energy to begin focusing on our wider community as well and we have parishioners that want to begin work with our neighborhood. Prophetic Listening is helping us to listen to the voices in our community, in our church and in ourselves to help discern what God is calling us to do and be as a congregation. ECM: What inspires you about Misa Aleluya? ER: What inspires me about the work I've I done at Misa Aleluya is the call of the Spirit to serve which I always respond with love, enthusiasm and commitment to attend to the desires of our Latino communities when they so eagerly embark in programs, projects, and new adventures in which they deepen their faith journey, explore, and realize God’s action and mission offered to each one of us in our communities and to the world. SH: I feel so inspired by so much at Misa Aleluya! The community at Misa Aleluya is perhaps what inspires, and rejuvenates me, the most, though. People are so incredibly invested in each other, in supporting each other, in sharing stories with each other, in feeding each other and looking after each other. It is inspiring for me to see a group of people who so reflexively and wholeheartedly come together to nourish spirits and bodies. When I visited for the first time, people were very welcoming, taking the time to come introduce themselves and give a kiss on the cheek during and after the service. The community shared a plentiful lunch, and after a sharing circle led by Ema and I, it was hard to get people out the door. We just kept hanging around and chatting as José tried to herd us out. At one point, I complimented one of the community members on her scarf, saying I loved the colors, and she promptly took it off and gave it to me. I protested, and so she gave me the opportunity to learn from her not just how to give freely and spontaneously, but also the importance of receiving gifts. Misa Aleluya inspires me because it is a place where gifts of all kinds flow freely. ECM: What do you hope comes from the work at Misa Aleluya? SH: I'm really hoping that the folks at Misa Aleluya, at the end of our work together, can see for themselves what I see already in them: a group of absolutely incredible organizers and community builders who are poised to make a lasting impact on their neighborhood, and on each other and those they meet. They are already organizers, already change-makers, already invested wholeheartedly --because of their own experiences and the experiences of those they love-- in the kind of deep structural change that our society so desperately needs. And they already have the tools to do it. I hope that the community feels the confidence in themselves, their vision, and their abilities by the end of this time that I already see in them! And I hope (and intend) to continue learning and growing from them in the process, and hope they will come to see themselves as the teachers they already are! ER: My hope for this partnership is for ECM not only to rejoice in what has been accomplished so far and as seen in Misa Aleluya, but also to give serious consideration to the importance of inviting Latinos and Latinas to the design team when programs such as Prophetic Listening are being envisioned and created with them in mind. We all can learn so much from each other! This Monday, March 4, is a very big day. 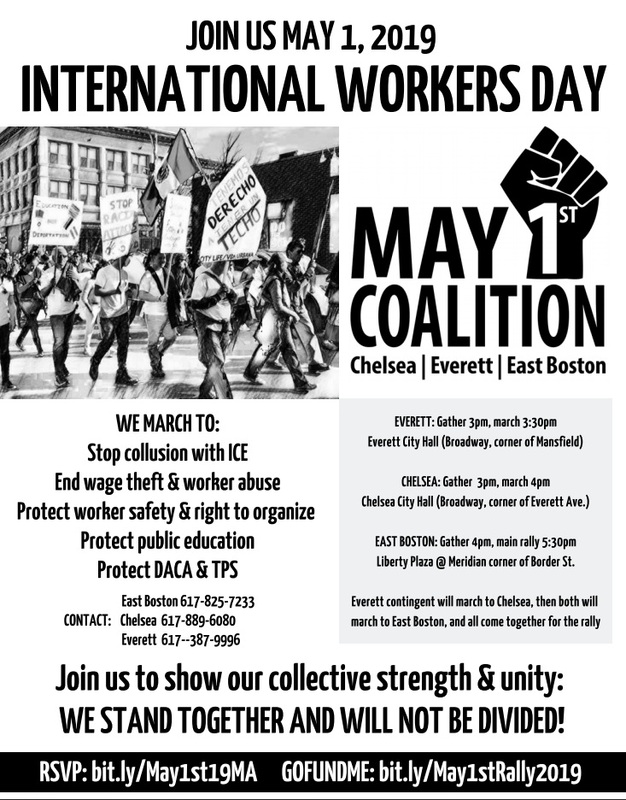 Hundreds of us will be at the State House for Immigrants’ Day, the biggest lobby day of the year for immigrants and refugees and allies, organized by MIRA Coalition. We will have a speaking program at 11am that will highlight the Safe Communities Act and breakout sessions at 12:30 and 1:15 pm that offer an excellent opportunity to promote the bill and discuss it with our legislators. Our keynote speaker will be Congresswoman Ayanna Pressley, and we’ll also have Senate President Karen Spilka, Safe Communities Act Senate sponsor Sen. Jamie Eldridge, and ACLU Massachusetts Executive Director Carol Rose, among others. But the most important part of Immigrants’ Day is lobbying, which MIRA has stepped up significantly for this year. After the speaking program, we have a breakout session in the Great Hall at 12:30pm focused on the Safe Communities Act, with Sen. Eldridge as well as House sponsors Rep. Ruth Balser and Liz Miranda and as many additional legislators as we can persuade to come join us. At 1:15pm, we’ll also have regional meetings: Merrimack Valley (Room 109), Essex County (Room 511), Worcester/Central Mass. (House Members Lounge), Metrowest (Room 222), and Southern Mass. (Room 350). Please join us! We want to seize this opportunity to make a big impact for the Safe Communities Act. Register here so we know you’re coming, and please call and/or email your legislators to ask them to join one of the breakout sessions, or else meet with you one-on-one earlier or later in the day. You can share the SCA factsheet and the event flyer with them (which shows dozens of event cosponsors). We also have some tips on how to speak to your legislators (English and Spanish). Read & Share the Fact Sheets in English and Spanish!